Nail School Week 5: Acrylics Ahoy! In week five, while we continued to work on an occasional client, we also began learning the fundamentals of acrylic sculpting. The first four weeks of school mostly covered services that I have some basic experience with, but when it comes to acrylic, it's all new to me! I definitely had some struggles at first, but things have steadily improved. 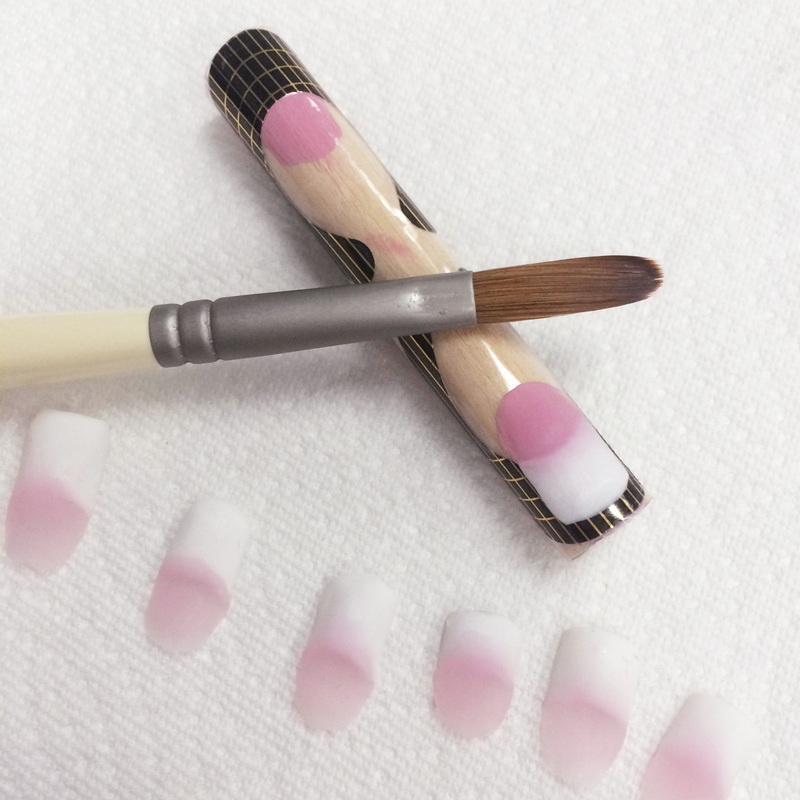 My school puts a big emphasis on sculpting acrylic nails from scratch instead of doing plastic tips overlaid with acrylic, so we started learning the basics of sculpting on our skill sticks. The first stick we used is the one with the black nail forms pre-attached. As you can see, my early attempts were kind of a hot mess. That's ok though -- it's the first time I had ever done it! The second skill stick comes without the forms pre-attached, so you can put your own nail forms on and then sculpt off the edge of the dowel. By the time we had graduated to the second stick, I had gotten a bit more confident in the basics of sculpting. We also learned how to file/buff our acrylics up to a high shine. We also got some fun nail art demos this week! 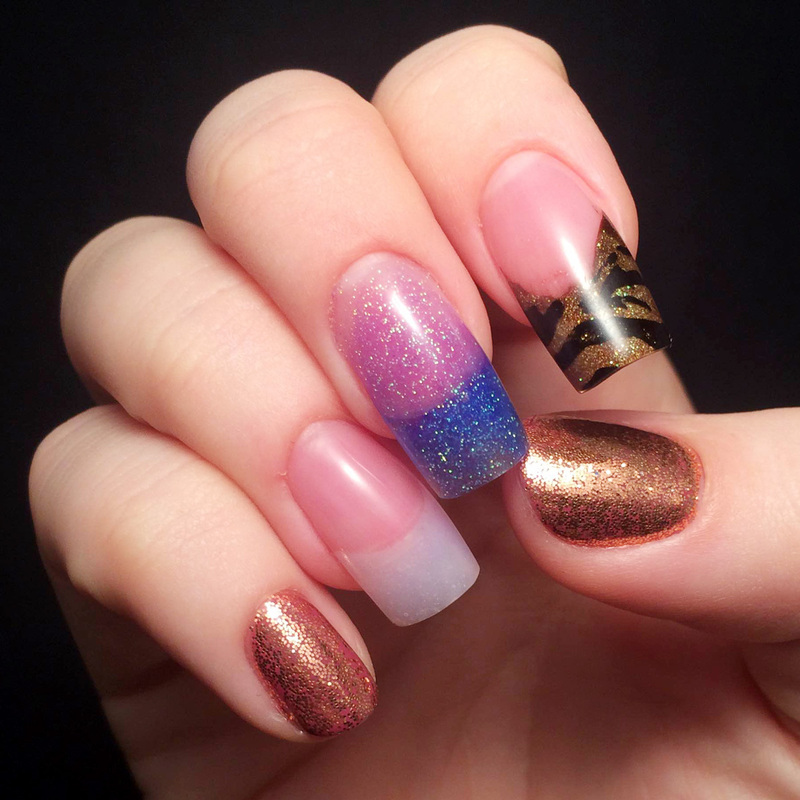 One of our instructors showed us how to work with colored acrylics and pigments to create unique sculpted nail designs, while another instructor showed us how to do ten different gel nail art techniques. I was the model for the colored acrylic nails, so here's my right hand with three long acrylics. It was strange, to say the least. I am not used to having my nails that length! 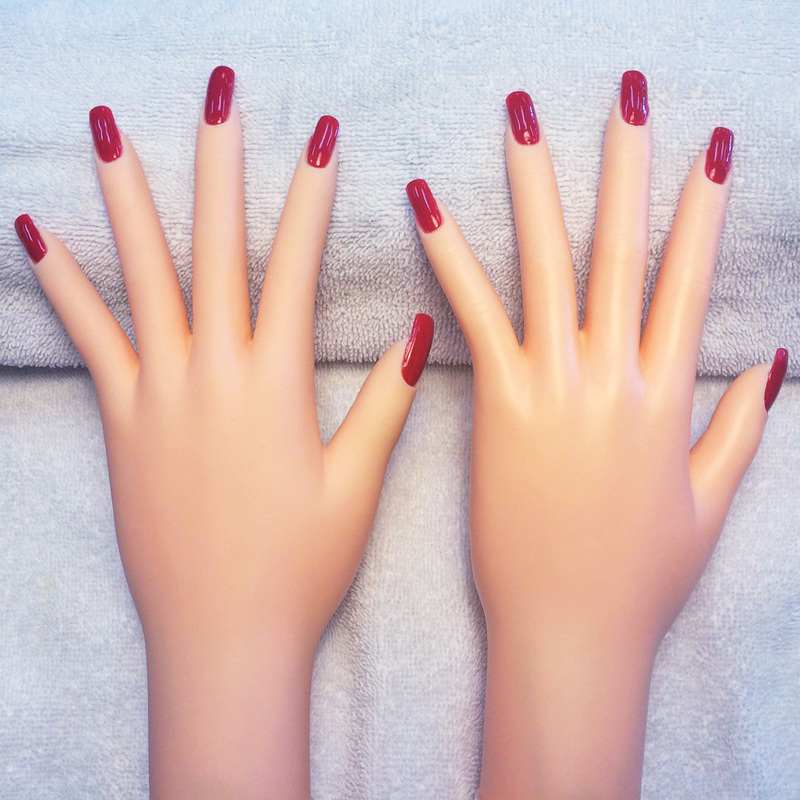 Additionally, we continued to practice our tip blending and fiber wrap services on our mannequin hands. Though my school discourages the use of tips, it is a required service for state boards. Here are my three ladies! I asked Instagram to help me name them, and my favorite suggestions were Chanail, Clawdia, and Felicia. My next hand will probably be named Regina Phalange. Say hello! I'm actually getting this recap out on time this week, which means that week six starts today. 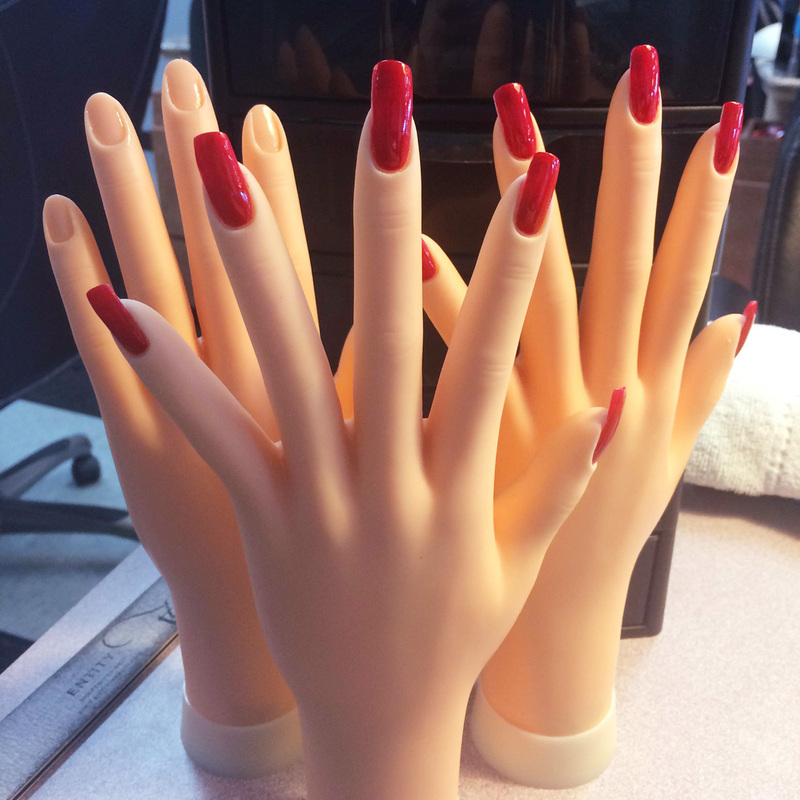 We'll begin sculpting acrylics on our fellow classmates and our mannequin hands. Thank you all for your positive feedback on this series! I'm having a blast writing it. Please feel free to let me know if you have any questions; I'd be happy to answer them if I can! Great to hear you've learning and trying acrylics and your getting more confident with them! Tips are useful. There's always someone out there who is impossible to fit a form on and doesn't want to take the time to sit and let you do it properly. It's so awesome to see this! Makes me want to go to nail school...except I already have a full-time career in finance, and there's no awesome school like this here (to my knowledge). So that's why everyone always asks me if I have acrylics! 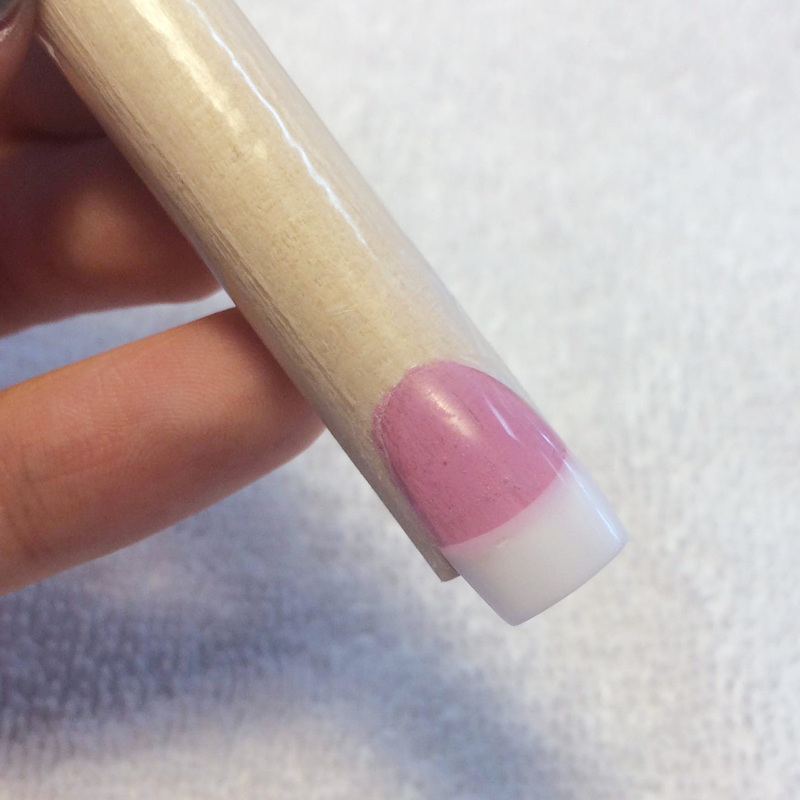 Let me know what tricks you learn for removing those acrylics without completely killing your natural nails! You should always remove them by soaking them off. Many nail shops use an e-file to remove them quickly which is what can lead to damaged nails. Cut them as short as possible, file the surface to remove the shine, and then soak them in a bowl of acetone for 15-20 minutes before trying to remove them (perhaps with a cuticle pusher or orange wood stick). I was wondering similarly to Kelly Gibson. More specifically, after I saw your hand with the acrylics on, I wondered how you removed them without damaging your own nails. Is the technique you describe above what you used? Were the acrylics easier to remove somehow because they weren't on your natural nails for very long? How long did you have these acrylics on? Thanks! Are you using your Canon S90 for your nail school pictures? When applying acrylics, do you use an e-file at any time, such as shaping the tips? And, in your first post in this terrific series you wrote, "I don't know what I want to do after I graduate, but I look forward to finding out what it is." I saw the post on Work Play Polish that you'll be joining her and JulieG in L.A. soon for a nail event. 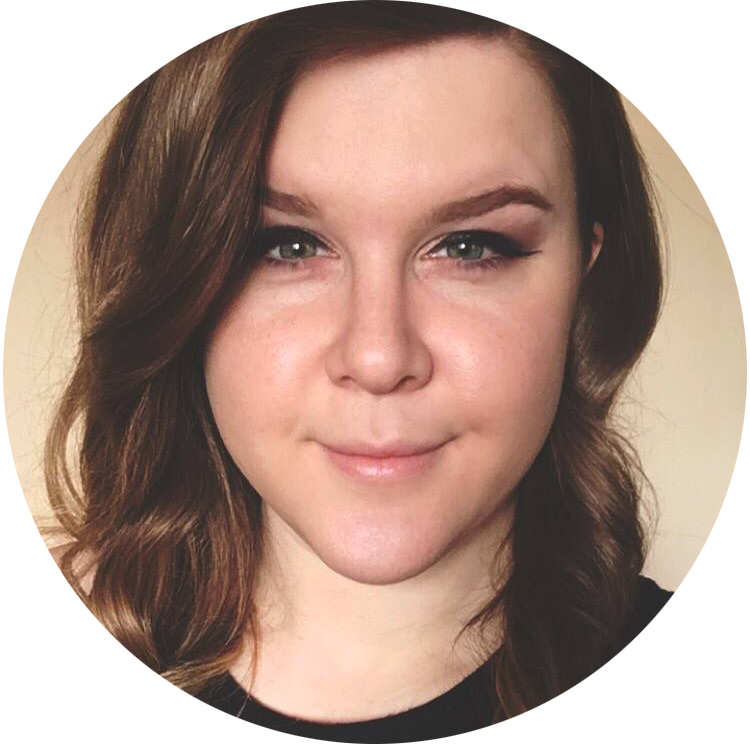 It seems like you have options/opportunities, brought about by your years of work and dedication to your blog, staying abreast of trends, going to CosmoProf, and now taking the plunge to go to nail school to be certified. I'm wondering if you have some thoughts now about what you'll do next? I had them on for about 30 hours or so. I used that technique to remove them and saw no damage! Acrylics aren't really as bad as people make them out to be -- lazy removal techniques is what can damage the nail. I have not yet handled an e-file. All acrylic filing is done by hand with a 100 grit file. It looks SO weird, your nails so long like that! Funny how used you can get to a nail length and shape on someone :). Your posts make me wish I went to school in Arizona. I'm currently finishing my Nail Tech program in New York and its NOTHING like what you're describing.... I'm living vicariously through you! Haha Love the names. Mine was Betty! lol I have a love/hate relationship with acrylic nails but I will say this...going to sculpt only was the best thing I ever did. It is just a little faster for me and to me it's a lot more natural looking. Not to mention it's cheaper because forms are cheap and tips can get expensive if you use the good ones. My love of them comes at the end when I see the finish product and I'm like "yeah, I did that!" lol. You're doing a great job! I am so glad that you are sharing your experiences at school! I can't wait to go to school myself! Still loving your recap of your school days. Keep up the good work.